This is what the “forest” I was in for work yesterday looked like. One of the teenagers I was with asked me why someone didn’t just cut down all the standing dead trees, and I explained that snags like this are actually important habitat for wildlife such as woodpeckers. It does look pretty bleak, but even on a hot, dry, dusty August day, there were splashes of color. That layer of purple is the aptly-named Fireweed (Chamerion angustifolium). It’s a “weed” because it’s a pioneer species, quickly colonizing disturbed habitat – especially (as in this case) burned-over forest, but I also saw it growing along roadsides back in Wisconsin. However, unlike a lot of weedy, fast-growing roadside plants, this is a native species. This is one beautiful, welcome weed. In the natural order of things, the trees that re-grow after a fire (you can see plenty of baby trees in the first two photos if you look) will soon out-compete the sun-loving pioneer weeds. Everything has its place and time, and even a bleak-looking forest of charred tree trunks is full of life. Two photos to start out your week, both taken at Bridge Creek Wildlife Area last Thursday. First, Clarkia pulchella, a wildflower first discovered by Lewis and Clark. It has several common names, but my favorite one, which comes from the branching petals, is deerhorn. Second, a deer with horns. Here, have some wildflower photos that I like too much not to post somewhere but that aren’t ever going to get individual blog posts of their own. I particularly like the one of the Mariposa Lily, for which I contorted myself into a knot on the ground to get a good angle. Last Thursday I found myself in a section of the Umatilla National Forest a couple hours’ drive north of where I’m living now, much closer to the border with Washington. It was beautiful – endless ridges covered with Ponderosa Pine, Western Larch, Grand Fir, and other majestic western conifers. However, I kept getting distracted from the trees by other, much smaller plants. Mountain Lady’s Slipper orchids (Cypripedium montamum)! They were all over the place, and the people I was with stepped right past them like they were no big deal, but as a newcomer to the ecosystem I was flabbergasted. I love lady’s slippers – I wrote about my first encounter with Pink Lady’s Slippers in a bog in Wisconsin last summer. Obviously the shape of the big petal pouch reminded some historical botanist of a woman’s shoe. Bumblebees crawl inside the pouch, attracted by colors and scents, only to discover that no reward of nectar awaits them. Then they bump up against the flower’s reproductive parts on their way out past the lip and hopefully carry the pollen to another orchid in bloom, where they’ll be duped all over again. (They do figure it out pretty quickly, though.) Fact of the day: the word “orchid” comes from the Greek word for testicle! Mountain Lady’s Slippers grow in high elevation forests in western North America. If you ever come across an orchid in the woods, please, please leave it alone – one of the major threats to these showy flowers is overzealous collecting by plant lovers. 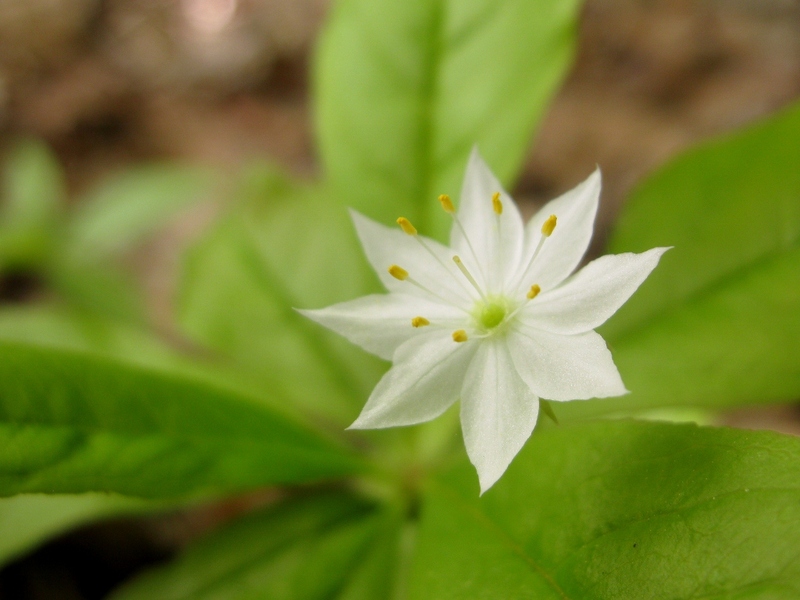 Northern Starflower, Trientalis borealis. Normally they have seven petals (an unusual number). I didn’t notice while I was taking the photo that this one has eight. Packing, cleaning, wrapping things up – it’s been two years since the last time I moved across the country, and I’d forgotten how involved it is. The plan is to get at least one more Northwoods post up before I leave on Wednesday. Said post will probably consist of me walking out to Inkpot Lake one last time and getting all sentimental about it. In any case, just trust me that normal blogging will resume… eventually. I’m still backpacking with my students in the wilds of Michigan’s Upper Peninsula, but some guest writers are stepping up in my absence. Today, blogger Erin Gettler shares the story of her “spark plant.” Read on to learn how she coined this phrase. Growing up in a suburb of Northern Illinois, I somehow got the idea that plants only bloomed ecstatically in gardens. Tame plants, I reasoned, are coddled more than wild ones, so they flower in abundance. I only rarely ventured into the woods as a kid, so my theory wasn’t refuted until recently. Now I live on the east end of Long Island, where a wide variety of ecosystems are preserved and open for exploration. And what I’ve learned about woodland plants in the past few years has revised what I thought I knew. There’s always a “first.” Birders call it a “spark bird,” and I guess we could also coin “spark plant,” to describe the initial instance that grabs your attention for life. 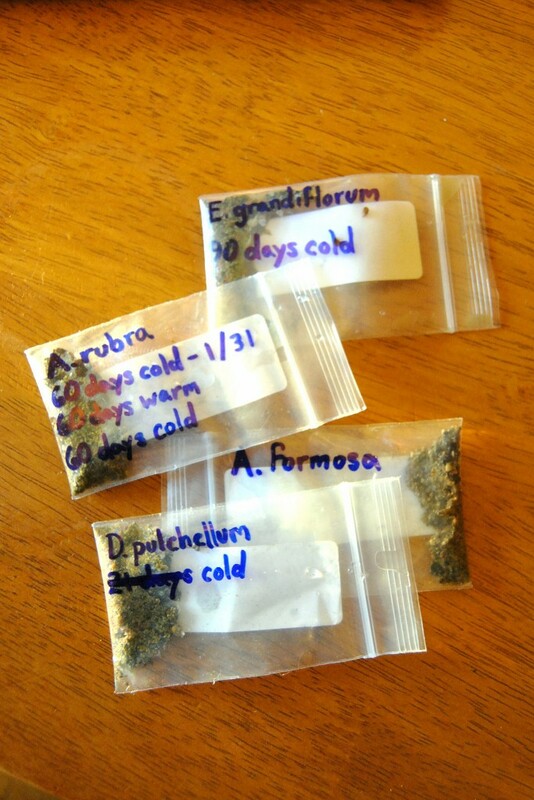 In my case, it was a brittle, draggled evergreen shrub that resembled the rhododendron bush in a relative’s front yard. I first visited this wild mystery plant in March, and the narrow, leathery leaves were among the few green things relieving the dull landscape. The buds swelled noticeably from visit to visit, March to May, in tandem with the rhododendron buds in the yard. When the rhododendrons finally bloomed, I made a beeline to the woods to see if the mystery plant had bloomed as well. It had, but it wasn’t a rhododendron. My mystery plant turned out to be Mountain Laurel (Kalmia latifolia), a tough shrub belonging to the same family (Ericaceae) as the rhododendron, as well as the blueberries that thrived in those woods. 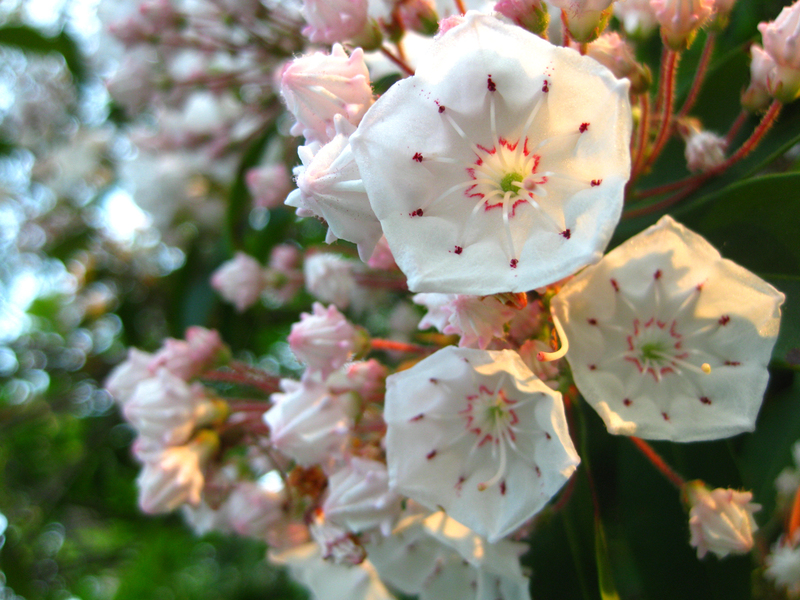 Mountain Laurel is easy to admire when it’s in bloom: blankets of rosy-white flowers transform the dingy green bushes into cloudy puffs floating in the woods. Dark pink anthers lodge in tiny pockets in the white petals. The stamens are spring loaded, and bounce up when you touch them, which I did over and over again for the fun of it. And then I stood back and breathed the whole thing in. Since that first time, I’ve made a pilgrimage back to the park whenever late May swings around. With repeated trips into the woods, I’ve plotted other blooms on my annual calendar. The first week of April I go hunting for Trailing Arbutus. 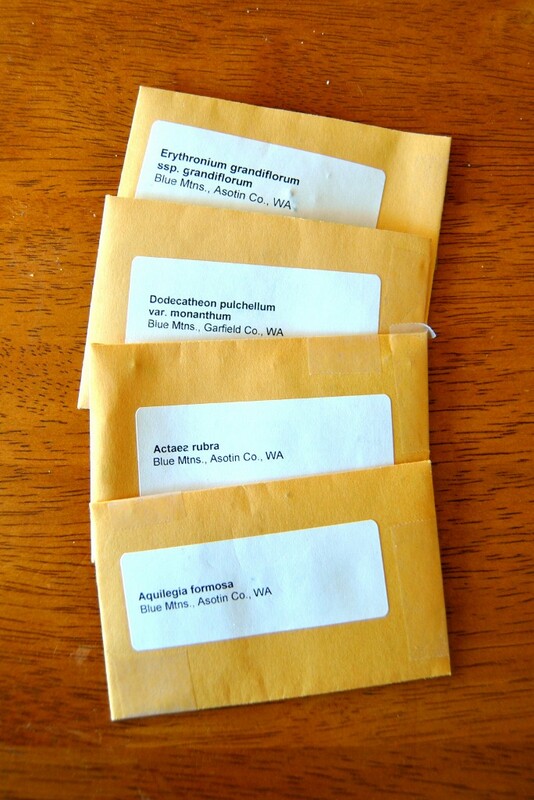 Mid-April is for blueberries, early May for Shadbush, then the Mountain Laurel. June brings back the Swamp Azaleas, and so on through the summer. It doesn’t get old, and each individual plant grows more familiar to me. It’s like I’m visiting friends. What are the blooms that draw you out into the woods, fields and swamps where you live? Erin Gettler takes pictures and writes about the natural world on the east end of Long Island, New York. She hopes to know something about everything someday, but she still has a long way to go. She blogs about these pursuits at The Familiar Wilderness.